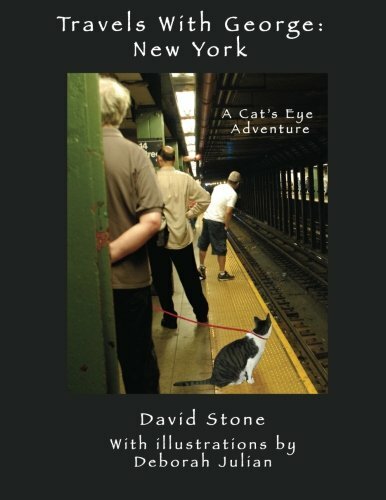 The adventurous cats first met in Travels With George: Paris are back, and this time, they are seeing the hometown sights in New York City. George tells his tale from his cat's eye perspective as he and Billy explore Central Park, take a borat ride out to Ellis Island and the Statue of Liberty, and finally they look at the city from the topEmpire State Building. Their travels are colorfully illustrated by Cat Artist Deborah Julian as she captures them in 13 original scenes around The Big Apple. David Stone is the author of best selling Travels With George: Paris (Deborah Julian, Illustrator). Along with art reviews and local interest articles for hard copy publication, he is the author of two full length books of fiction (The Garden of What Was and Was Not, Traveling Without A Passport), a work of nonfiction (A Million Different Things: Meditations of The World's Happiest Man) and more online articles and blogs than he can count. He was born in Binghamton, New York, and spent ten happy years in Buffalo before settling in New York City, where he lives and works today, in 1990. He loves his wife, his cats and his readers, usually in exactly that order.